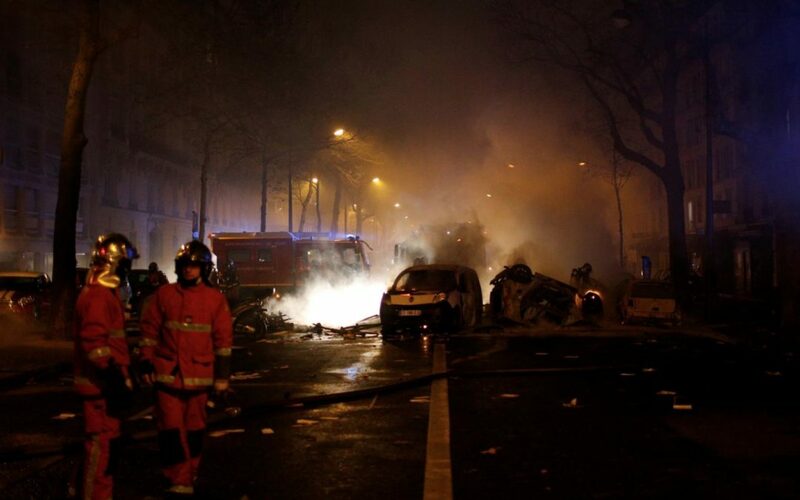 SNIP: Groups of young men with faces masked, some carrying metal bars and axes, rioted on the streets of central Paris on Saturday, setting a dozen vehicles ablaze and torching buildings, unleashing the city’s worst urban unrest for years. Police said several hundred far-right and far-left extremists had infiltrated a demonstration by some 5,000 calmer “yellow vest” protesters who had gathered in the capital to denounce President Emmanuel Macron’s fuel tax increases. Youths smashed the windows of the flagship Apple Store on the Champs Elysees which opened just a few weeks ago. A boutique on the Rue Rivoli was broken into and looted. Banks were vandalized and scrawled with anti-government graffiti. “We are in a state of insurrection, I’ve never seen anything like it,” Jeanne d’Hauteserre, the mayor of the city’s 8th arrondissement, near the Arc de Triomphe, told BFM TV. On the Rue de la Paix, one of Paris’s most expensive shopping streets, Christmas trees were left smouldering after firemen put out at least three blazes. The jewelry stores and fashion boutiques were locked up, but the Christmas decorations on the street were still sparkling. It is the third week of national unrest by the movement — named after the high-visibility jackets that all motorists in France must carry in their vehicles — and the second consecutive weekend of violent disturbance in Paris.